Do you feel annoyed when brands suddenly come up with a flurry of new perfumes or even complete new lines? I usually do: not only there is no real need in that many new perfumes launched at the same time adding the next wave to the already flooded market, but is it even possible to do anything worth releasing in those quantities in the time frame between previous and next releases? Theoretically – maybe, but I doubt. But what if it’s a new brand? Well, it seems that launching a brand with just 1 perfume would be a very risky enterprise. One could do it if it were a side line, an addition to an established fashion, cosmetics or perfume reseller business. But when launching a “stand-alone” perfume brand, one has to start with at least 3 perfumes. And most small brands do exactly that. Five perfumes? Still reasonable, though already pushing my personal limits. When Sylvaine Delacourte, a perfumer behind my favorite Cruel Gardenia, among other things (such as being a Perfume Creative Director at Guerlain for 15 years) that made me distinguish that brand from dozens of others appearing every day, came out with her first set of five – Musk Collection, I got curious, ordered a set of samples, tried, shrugged my shoulders and moved on. Why have I decided to go for the second 5 perfume collection two years later? 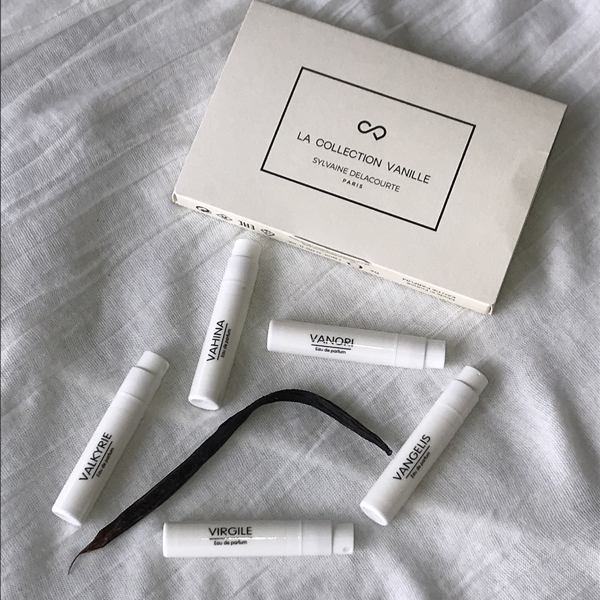 Three reasons: I didn’t hate the first collection just didn’t find anything to love; it wasn’t expensive; and finally, I was going to Hawaii and I thought that Vanilla Collection was a perfect companion to accompany me there. 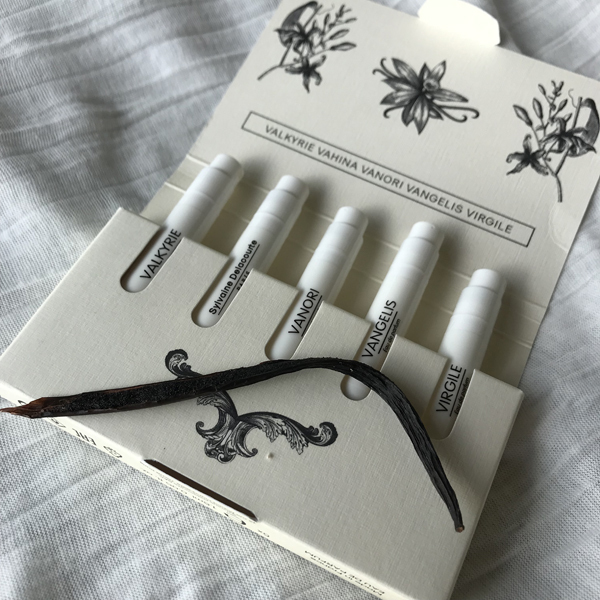 Since all perfumes are centered on the same main ingredient – natural Madagascar vanilla beans (at least this is the claim on the website), I didn’t expect to like them all: that would have been counter-productive to simultaneously release 5 perfumes that would cater to the same taste. I was right: Vanori, Vahina (an unfortunate name for perfume for either Spanish- or Russian-speaking audience) and Vangelis were all quite nice (2.5 to 3 sea stars) but none of them called for more than a couple of lines in my perfume diary. So here I’ll share impressions of the two that worked for me. Virgile, with official notes: rose, rosemary, clary sage, geranium, vanilla, leather, mandarin, cedarwood and bergamot, being the fifth (as in its position in the box) perfume, kept slipping my attention: even though I tested it several times, somehow by the time I would come to the end of the set, I’d be distracted by something and wouldn’t record my impressions. Recently I finally got to test it properly, and while I wish it was “woodier” on my skin, I liked both herbal opening and dryer vanilla drydown enough to want to wear it. Had I checked notes for Valkyrie beforehand, I would have thought that it was the least likely candidate from the bunch to attract me. But I haven’t. Valkyrie and I clicked almost immediately, and it happened thanks to a completely unexpected association. In my childhood, as I can remember, ambient scenting wasn’t something usual or customary. Life wasn’t scentless: women wore perfumes and deodorants (if they could get them); men wore colognes and aftershave; dwellings smelled pleasantly of food, baked goods, or sometimes cut flowers or unpleasantly of mothballs and doubtful bathroom fresheners; and I’ve previously mentioned a peculiar use of nicely smelling “imported” soaps as drawer sachet. But I can’t remember any scented candles, diffusers or room sprays – it just wasn’t a part of the culture. In my mid-teens there was a surge of exotic and unusual products from India. It doesn’t mean that they were readily available (nothing good was), but if you “knew right people” or just happen to be at a store at the right time (store employees just had to sell at least some quantity of goods to the public before they could re-sell the rest for higher prices to people they knew), you could get lucky. Somehow my grandmother (the same one who introduced me to my all-time perfume love Lancôme Climat) got several boxes of incense cones and shared them with me. Those were precious and cherished objects: none of my friends or classmates had anything like that, so I felt really special when I would burn one or two of the cones for a birthday or some other gathering at my place. 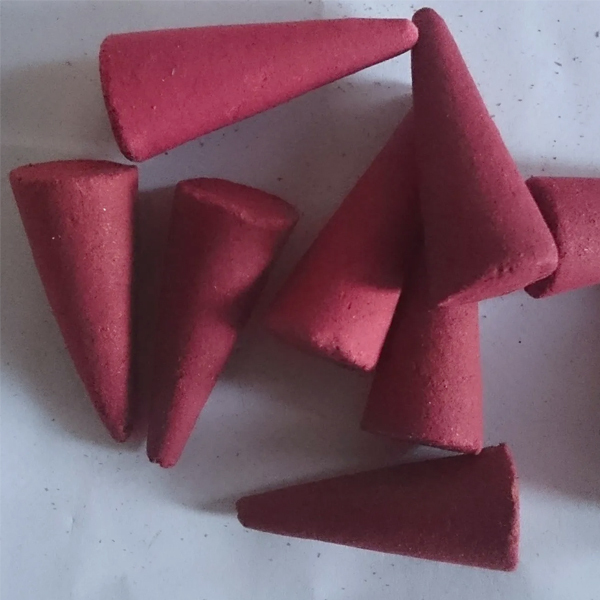 I loved how those incense cones smelled but have never experienced the same scent after they were gone, even though since then I’ve tried dozens of incense sticks, cones and spirals. I put it to the normal change of perception with age… until I sprayed on Valkyrie. I suspect that it’s some particular combination of sandalwood and vanilla that is responsible for the olfactory hologram, but sans smoke, what I smell from my wrist when I put on Valkyrie takes me back to those special moments that combined sensory joy and pride of possession. I do not think I need a full bottle of any of these perfumes but luckily Sylvaine Delacourte offers several great options: you can buy mix/match sets of refill travel sprays 2 x 7.5 ml or 4 x 7.5 ml (this one comes with a holder). I went with travel sprays of Valkyrie and Virgile. If you haven’t tried these collections yet, currently the site offers both sets for $15, including S&H, and that price can be deducted from your future purchase. When I placed the order, I got my personal link to share with friends: LINK . It’s the same offer as you can get directly from the site plus some extra in future if you decide to buy any of perfumes after you try the samples (if you do, contact me after you buy a bottle, so I could provide information you’ll need to get your free candle).